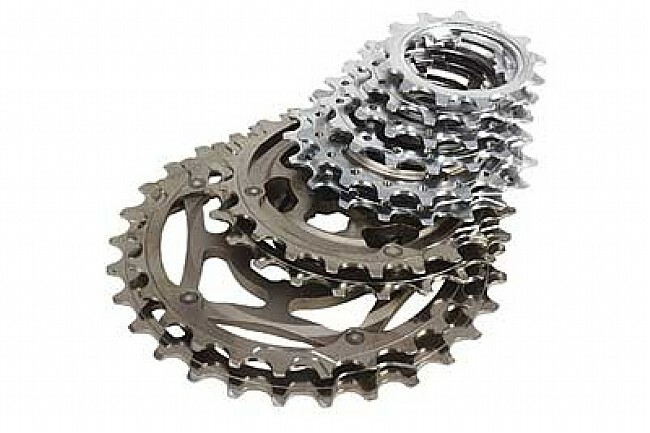 The Record UD 10-speed cassettes use the race proven Ultra-Drive system. Tested under all weather and race conditions at the Tour de France, the Record Ultra-Drive system worked to perfection. The Ultra-Drive system makes shifting more precise and fluid, especially thanks to the careful machining and treatments that the sprocket teeth have undergone. The special sprockets pattern interfaces perfectly with the rest of the drivetrain components, especially the chain and chainrings, thus bringing performance to levels of outstanding excellence. Campy Chorus came my ti bike 10 years ago. I've since upgraded to this Record cassette for a time trials wheel. Thing about Campy 10 speed ... it'll shift smoothly no matter what you do to it. In the heat of a race I've stupidly shifted to the biggest cogs while still on the big chairing, and vice versa, and the system just smoothly goes there. While overpriced, the titanium cogs on the Record show no sign of excessive wear, probably because they're the four big ones. (Bike Tires Direct, you might check your description. Isn't it 7 through 10 are titanium ... 1 through 6 are steel? They are on mine ... unless Campy has changed the Record.